CHARMED LIFE with Elephant - Pin of Arkansas Rock Crystal, Carved Bone, Citrine, Pre-Embargo Coral, Jade, Copal Clasp your shawl now - your beach sarong later - here's the next in our Charmed Life series to do it with! A gleaming multi-terminated rock crystal is wire wrapped to a pre-embargo real coral...to a mellow copal drum. 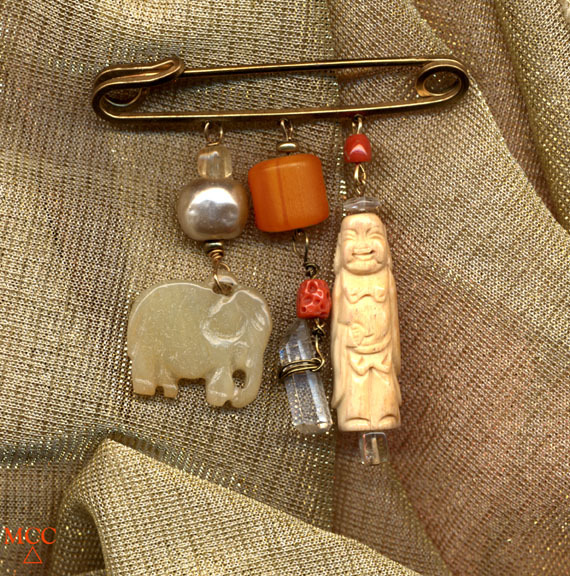 The happy bone Buddha to a second coral, and the smooth jade elephant to a vintage large glass pearl and citrine. So popular - and yours will look remarkably like the one featured. 2 1/2" wide by 3" tall to safely pin you together...you're stately and sleek.